Evergreen and some deciduous shrubs flowering on previous or current year’s growth. Tidy prune. Example varieties; Magnolia, Rhododendron, Azalea & Camellia. Deciduous shrubs flowering in spring or early summer on previous year’s growth. 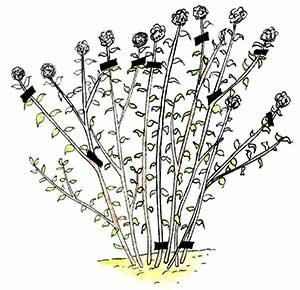 Cut back shoots that have flowered and remove one quarter of the oldest stems. Example varieties; Buddleja alternifolia, Deutzia, Forsythia & Philadelphus. Deciduous shrubs flowering spring or early summer on previous year’s growth. New growth produced at or close to ground level. Once flowered should be cut back to near ground level. Example varieties; Kerria & Neillia. Deciduous shrubs flowering mid to late summer on previous year’s growth. Trim off old flower heads and cut back the oldest stems by half their length. Example varieties; Hydrangea macrophylla. Deciduous shrubs flowering late winter to early spring on previous year’s growth. Hard prune close to base of the plant after flowering. Example varieties; Prunus triloba. Deciduous shrubs flowering mid to late summer or autumn on current season’s growth. 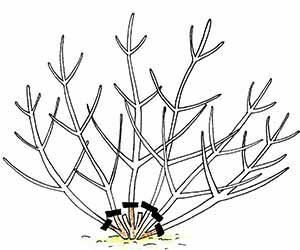 Prune all stems fairly hard early to mid-spring. Example varieties; Buddleja davidii, Caryopteris & Fuchsia. Deciduous and some evergreen shrubs grown for attractive young stems or large leaves. Prune very hard late winter or early spring i.e. stooling. Example varieties; Cornus, Cotinus, Rubus & Sambucus. Evergreen shrubs flowering winter to early summer. Best left unpruned but tidy weak or dead stems and remove spent flower heads/seedpods. Example varieties; Rhododendron, Viburnum tinus & Box. Evergreen shrubs flowering summer & late autumn on previous or current season’s growth. Tidy prune mid to late spring. Example varieties; Eucryphia, Prunus laurocerasus & Prunus lusitanica. Evergreen shrubs flowering on previous year’s growth in spring or early summer, or on current season’s growth in late summer and autumn. Cut back flowered shoots to previous season’s growth. Example varieties; Calluna, Erica & Lavandula. Vigorous climbers flowering on previous season’s growth. 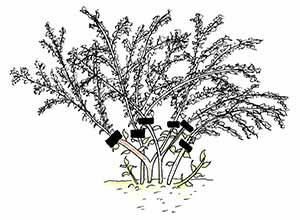 Tidy prune to keep shape and within bound in late winter or early spring or after flowering. Example varieties; Trachelospermum, Lonicera, Akebia & Parthenocissus. Moderately vigorous climbers flowering on previous season’s growth. Prune side shoots quite hard, thin out overcrowded stems late winter or early spring or just after flowering. Example varieties; Solanum crispum & Plumbago. Wall trained deciduous and evergreen shrubs flowering on previous season’s growth. 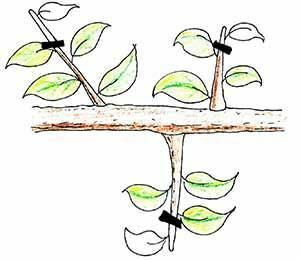 Shorten side-shoots, remove wayward stems to keep shape and shrubs flat. Annually after flowering or late winter to early spring. Example varieties; Ceanothus, Chaenomoles & Garrya. For Pyracantha and Cotoneaster, cut back shoots during growing season and late winter. For the majority of Perennials you would simply cut down and clear spent flowering stems either in autumn or early spring, although there are a few exceptions and sometimes timings can be down to personal preference. An example of this would be some sturdy stemmed perennials, such as Sedums, where you may wish to leave the flower heads until spring to provide added interest over the winter. Another good example would be most perennial grasses, whose flower heads can add dramatic atmosphere to a garden within the winter months, before cutting right back to the base in spring in preparation for new growth. 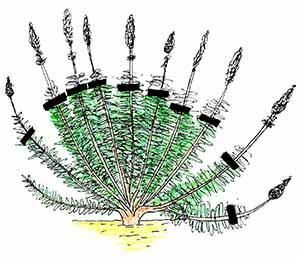 However this does not apply to Stipas, which merely require a hand running through them to rake out old, dead growth. Perennials like Penstemons, Perovskias and Caryopteris should be pruned down to a good bud in spring to stimulate growth. 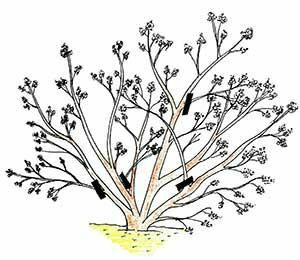 Hardy Geraniums should also be cleared down to the crown, as this will then quickly generate fresh new growth within a month. Generally Perennials just need a good tidy up as you see growth die back. Selected perennials can be pruned throughout the summer in order to encourage a second flush of flowers. This is commonly known as the ‘Chelsea chop’. 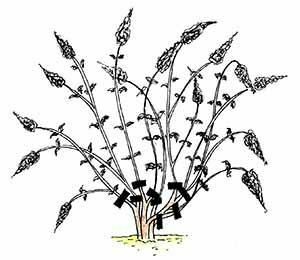 Plants that would benefit from deadheading in this way are Salvias, Geraniums and Heleniums.